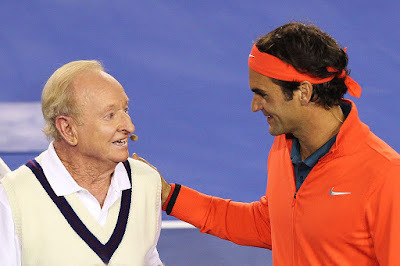 Australian tennis legend Rod Laver believes Roger Federer still has another major victory in him despite the Swiss suffering yet another Grand Slam defeat to Novak Djokovic in the Australian Open semi-finals on Thursday. Federer has been in search of a record-extending 18th Grand Slam trophy ever since he won his 17th at Wimbledon in 2012. But the World No.3 has been stopped in his tracks - losing to Djokovic in their last four major showdowns (Wimbledon final 2014 and 2015, US Open final 2015 and Australian Open semi-final 2016) - and many wonder whether Federer, at 34, can add to his tally. Laver, who is the only player to complete the Grand Slam twice, in 1962 and 1969, believes Federer can still win another major. “I tend to think so,” said Laver. “I thought even this time he looked like he was playing great tennis those two matches prior. So when you see that, you think ‘well, yeah, Roger’s got a chance’. “So, yeah, somewhere around the line maybe Wimbledon is an opportunity for him to do that. “He certainly knows the territory. He knows the competition. If he gets a good draw, and I think that’s always very big, there’s probably two, three, four guys that you would really rather not have to play. If they’re in the other half, you’ve got an opportunity. Federer was destroyed in the first two sets against Djokovic in their semi-final on Thursday before he stopped the bleeding and took the third, eventually losing in four to the World No.1. Laver paid tribute to Djokovic’s form and says there wasn’t much Federer could have done differently. “Looking at the mistakes, I think Novak had maybe five mistakes in those two sets. It was just quite incredible the speed he was getting around the court and being able to hit great shots down the line, just an inch inside the line,” said the 77-year-old.